It’s that time again when I go crazy and make a book free. 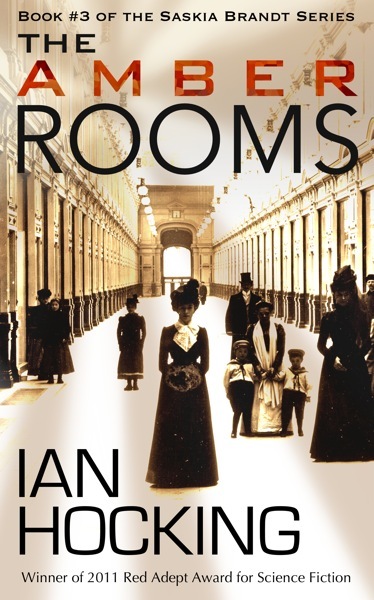 For the next few days, it’s The Amber Rooms (UK Amazon link, US), the third adven­ture in the increas­ingly mys­ter­i­ous life of time trav­el­ler Saskia Brandt. In this book, she learns more about the nature of her time para­dox, and a great deal about Tsarist Russia and how to get along with revolu­tion­ar­ies. The plot is one of the most ima­gin­at­ive I have come across in quite a while. Time travel at its best! This story begins with a per­son like me. When I pub­lish ebooks, I want them to turn out exactly as I intend. That means tak­ing the text of the story, sand­wich­ing it with front mat­ter (like copy­right) and more text at the end (like acknow­ledg­ments). Until recently, I wrote my books using the word pro­cessor Apple Pages. I would export this to a Microsoft Word doc­u­ment for my edit­ors and proofread­ers. Then, when the book was ready to be con­ver­ted into an ebook, I would do a lot of the work by hand. And therein lies the prob­lem. There’s a lot of manu­al effort involved when you take a Word doc­u­ment and pro­duce some­thing that Amazon or iBooks will accept as an ebook. In this post I’m going to talk about using plain text files to con­sist­ently and pain­lessly pro­duce ebooks. I won’t assume much know­ledge. There should be a sep­ar­a­tion between style and con­tent. Style is font size, para­graph spa­cing, and all that jazz. The con­tent is the text itself. Word pro­cessors like Pages or Microsoft Word com­bine style and con­tent into a single file. These files are com­plex, con­tain ambi­gu­ities, and are dif­fi­cult to read without a work­ing copy of the pro­gram that pro­duced them. When you sep­ar­ate style and con­tent, many advant­ages res­ult. The con­tent file doesn’t need to be in a pro­pri­et­ary format. It can be plain text. The con­tent file will be eas­ily read by a com­puter, which means the com­puter can auto­mate cer­tain things for you: cre­ate an ebook, a nice-look­ing PDF, a PowerPoint present­a­tion, a web page…all from the same con­tent file. But how do you make the con­tent file? Markdown was cre­ated by John Gruber as a way of writ­ing for the web without includ­ing the dis­trac­tion of mark-up tags (more below). It has been exten­ded by sub­sequent pro­gram­mers. In the moment before Saskia Brandt awoke, she had a vis­ion of red chrys­an­them­ums fall­ing. The flowers looked unreal. Their stems were too straight and their falls too slow. Their *Gestalt* was art­ful sad­ness. What you’re look­ing at above is a plain text snip­pet. The # char­ac­ter means that the text Red Star Falling should be treated as a head­ing (just like a head­ing in Word). Two ## char­ac­ters means that this is a head­ing level two. Immediately, you can see that this is a fool­proof way of telling a com­puter that the text is head­ing level two; at the same time, it’s easy for a human to read. char­ac­ter to enclose the German word Gestalt. This tells the com­puter to emphas­ise the word. In this case, it makes it ital­ic. OK. So I’ve writ­ten the first para­graph of my glor­i­ous story. What do I do with it? If you’re not famil­i­ar with HTML, this will look a bit weird. The import­ant thing to note is that the ori­gin­al Markdown format text will reli­ably pro­duce the HTML. How much do I love Markdown? Let me count the ways. The thing that I, as a writer, look at, is a plain text file writ­ten in Markdown. It doesn’t get much sim­pler. I don’t need to worry about smart quotes and dash sizes–all this is done when cre­at­ing the HTML. Because it’s a plain text file, I can work on it from a com­puter of vir­tu­ally any type (desktop, laptop, mobile), any age (even ancient PCs can read text files) and any plat­form (plain text files are very port­able). Helper pro­grams can take this Markdown put it into any form I like: PDF, .mobi, epub, and so on. It can take some time to set up these help­er pro­grams, but you only have to do it once. In ten years’ time, the file will be super easy to open. It’s plain text, not a pro­pri­et­ary word-pro­cessing format. Most of my writ­ing takes place on two devices: A MacBook Air and an iPad. My work­flow is there­fore Mac-cent­ric. However, the approach should work on any sys­tem. 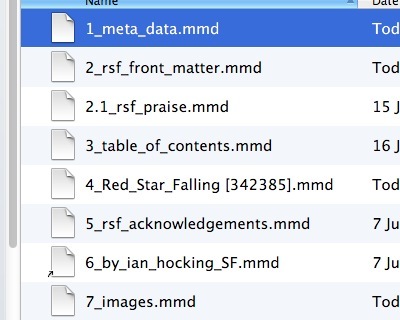 Here is the point where I real­ise that my own work­flow files are hope­lessly hard-coded to my own sys­tem, and provid­ing you with a work­ing example of Red Star Falling that you can down­load and play with is impossible without edit­ing my files. So, instead of giv­ing you these files, I’ll explain the pro­cess in plain English. Adds them togeth­er to make a single, large Markdown file. Uses the Multimarkdown com­mand-line tool by Fletcher Penney to cre­ate an HTML ver­sion of the book. A sep­ar­ate style sheet (see Useful resources) is used to cre­ate the final ebook style that I like. This tool also smartens quotes, cre­ates prop­er dash char­ac­ters, etc. Passes the HTML to the ebook-con­vert­er com­mand-line tool by the indefatig­able Kovid Goyal, which cre­ates an Amazon-com­pat­ible .Mobi, iBooks-friendly .epub, and a PDF for good meas­ure. I’ve now writ­ten a fol­low-up to this post that includes a detailed example. My Writer as a Stranger CSS (Cascading Style Sheet). Use this in com­bin­a­tion with a Markdown doc­u­ment to pro­duce a book with the same final format­ting as Red Star Falling. Markdown tools from Brett Terpstra.